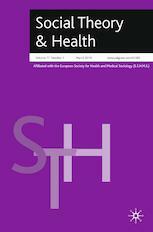 This journal explores the role of health in modern societies around the world, bringing numerous strands of theoretical research to bear on contemporary practical issues in the planning and delivery of health services. Social Theory & Health gathers contributions from all relevant disciplines in medicine and the social sciences to report on current high-level discussion and controversy over the capabilities and limits of health care in today's world of rising cost and shifting population. Also included are observations and insight from clinicians involved on the front lines of treatment and care. The contents touch on a range of topics as broad and deep as health care itself. Coverage includes discussion of public trust in the health care system; health, care and society beyond the paradigm of growth; and public anxiety and health policy. Practical examinations of specific areas of health include obesity and weight-related stigma; psychiatric science and the DSM-5; diagnosing dementia; early research on the relationship between cancer and child abuse and more. Articles discuss the nature of health care in post-industrial urban life; among people with a range of physical and mental disabilities; in immigrant and refugee populations; and among peoples across the developing world. Social Theory & Health benefits scholars of health-related sociology; nursing, health and clinical psychologists; health and public policy analysts and theorists in related disciplines.